Hankook Tire released the new Dynapro AT2 RF11, an all-terrain tire with major improvements that makes it your go to tire if you are looking for off-road traction and on road manners. Designed to provide superior performance both on and off road, the new AT2 RF11 is replacing the Hankook Dynapro AT-M RF10 and comes in more sizes than it predecessor. The Hankook Dynapro AT2 RF11 has improved all-terrain performance and delivers a quieter ride compared to the AT-M RF10. The biting edges and dual shoulder lugs give it extra durability and add enhanced puncture and cut resistance. The aero shoulder technology further reduces noise for optimum on road driving. You can take this tire anywhere with its M+S rating and 3 Peak Mountain Snowflake Symbol indicating it is rated for severe snow service. The Hankook Dynapro AT2 RF11 has some great improvements over the Dynapro AT-M RF10. Multi-directional tread design which offers an increased traction in wet, winter and off-road conditions, reduces road noise and increases ride comfort. The Hankook Dynapro AT2 will be manufactured in Hankook’s new plant located in Clarksville, Tennessee, as well as other Hankook facilities. The Hankook Dynapro AT2 is available in 35 p-metric sizes as well as 42 Light truck and SUV sizes. 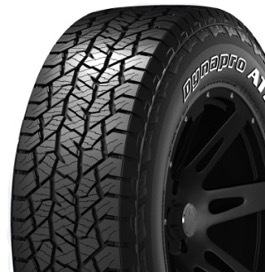 If you are looking for an aggressive all-terrain tire that also provides you a great ride for your day to day driving, be sure to take a serious look at the Dynapro AT2 RF11. We have a large selection of the Hankook Dynapro AT2 and the Dynapro AT-M tires in stock now. Start your search for your new all-terrain tires today!